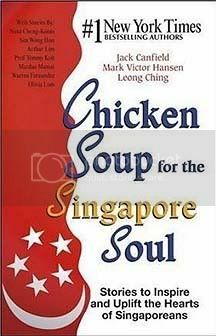 Where you can learn knitting and crochet in Singapore! October 2016 Free Course Preview Session! Our 16 Oct 2016 (Sun) @10am free course preview is now open for registration! 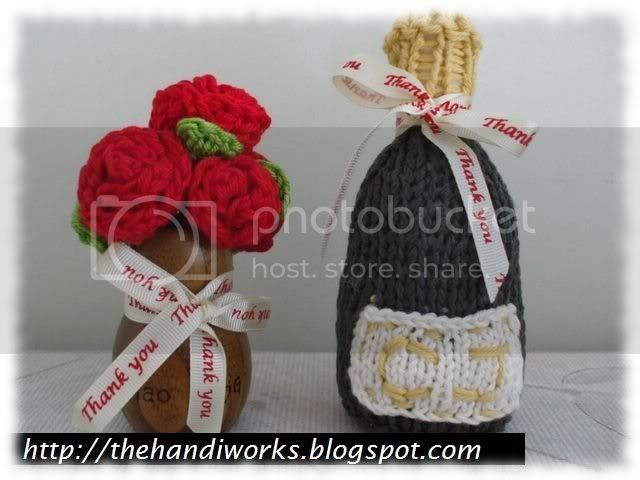 Crafty Wedding Ideas; knitted and crocheted! But we do know that customers do look forward to an long quiet read; presumably to go along with the mindless zen knitting they have on hand. Although their words is that reading about the "behind the scenes" on why new customers wanna join us or the rationale of embarking on a specific project is far more appealing than the cursor short, sweet, simple post. 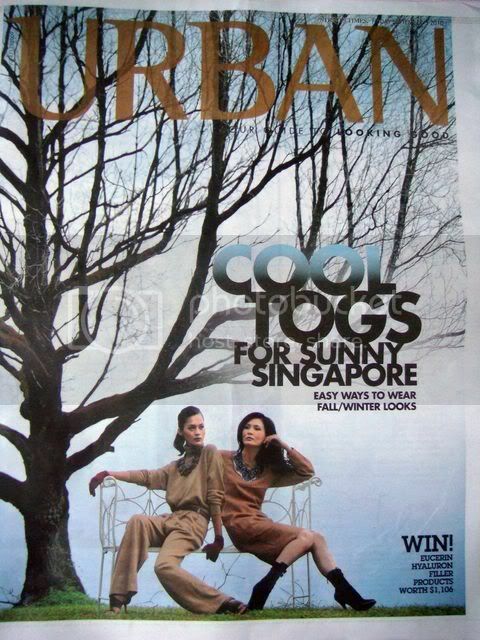 - Ladies in Singapore are still pretty excited and thrilled at the idea that we would wear these hand knits and crochet items in our hot weather. - The only difference is that we have fewer previews than before. Now back to our regular scheduled knitting and crochet. 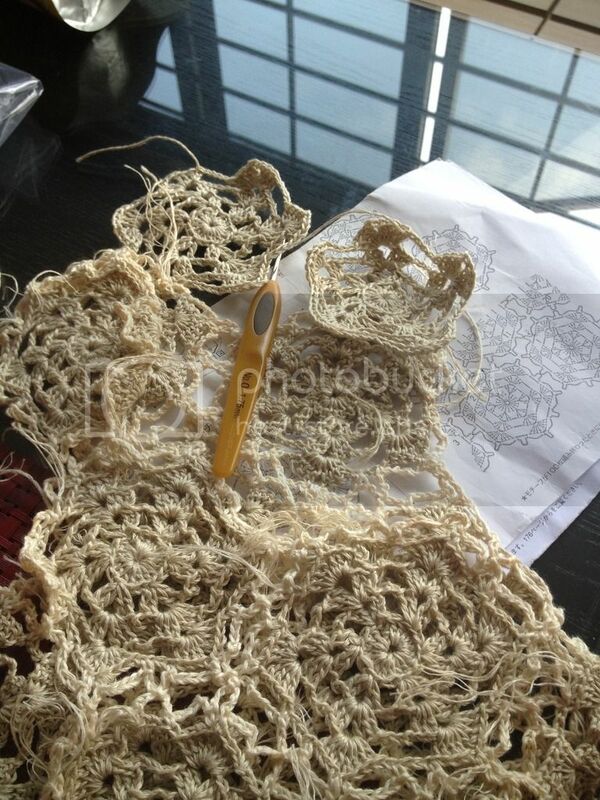 I am sure many of you caught a glimpse of this gorgeous two tone crochet WIP in our recent FB posts. This is a project that was created by one of our long-time customer here at The Handiworks. Really long coz we have met before she married and now her kid is 3 years old! 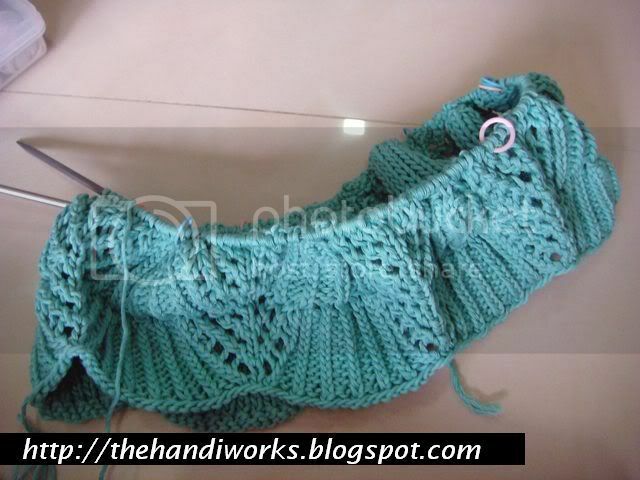 It has been languishing in the WIP basket for a long while as she has issues with the armhole fit when she was nearing completion back then. 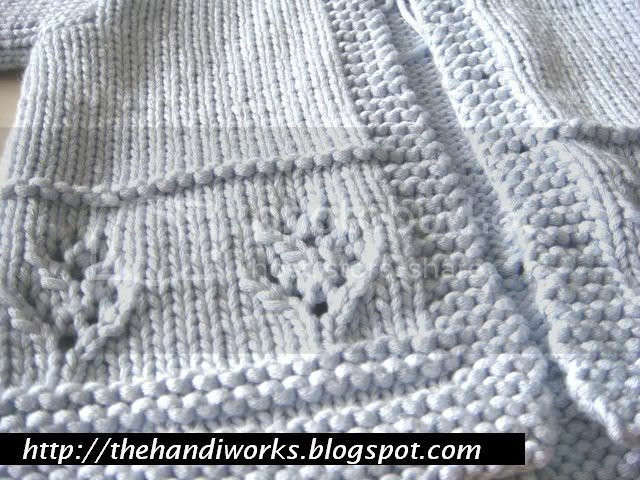 So it was time for a re-think as to how to the sleeves can be crocheted in such way that they will be re-adjusted for a proper fit. We are crossing our fingers that the tweaking works! If you have been following our FB page, you would know that The Handiworks is still very much well and alive. We are just bummed that time is just a scarcity these days (and it's not just us) and so FB posting just became the de-factor operandi until we get properly seated in front of the laptop to start cataloging photos and do some real writing. Yes, we have been prodded by knitting needles of our customers asking when we are going to blog next. While the prodding don't hurt (seriously, it would be too wicked to think of using our knitting needles as weapons), we are genuinely thankful that our customers still love to read all about each others' new project adventures. So in the meantime, we will rather swath ourselves and put on oversized sunnies like Joleena's stylish model does before we step out of the house! You see, there has been lots of activities and action where the lessons of clicking needles are concerned. Or the previews that we organize monthly for new customers. 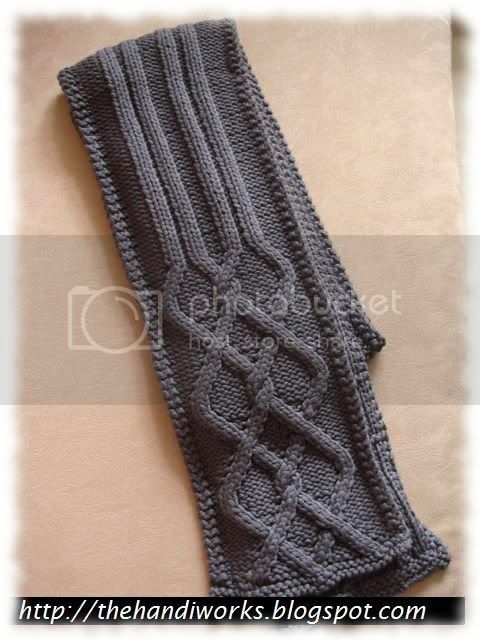 Our facebook page has lots of yummy work in progress and FO photos to show for that. Too much fun, too little time! This blog got sidelined as it was easier to snap photos and then upload on the go. However, technology is improving each day so we should be able to revert back to blogging sometime soon...albeit slowly. Please be patient with us. 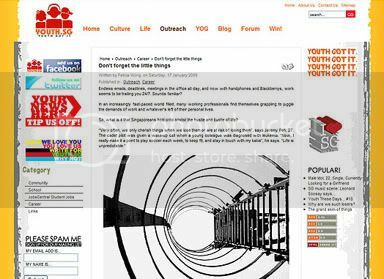 By the way, this blog is 8 years old now! 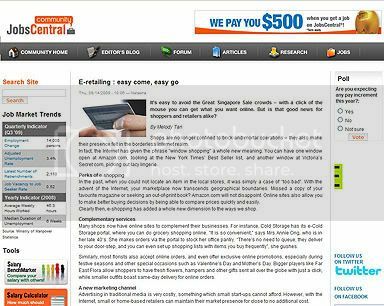 So if you happen to see any broken links or missing pictures when you are clicking about, do let me know. We want to thank all our customers for their great support! Your incredible patience when it comes to signing up and taking previous time to attend our previews. And most importantly, your persistence in mastering the craft and creating lovely thoughtful pieces. For those of you wanting to join us, we'll see you at the preview this Sunday. Have an awesome holiday break! ...On this blog, that is. Sorry for the silence. We've been having way too much fun making new friends and whipping up fantastic projects! Often, we blog way too much about the starts, the journeys and miss out the critical finished project photos. Here's one knitted and modelled by Chai Bee. 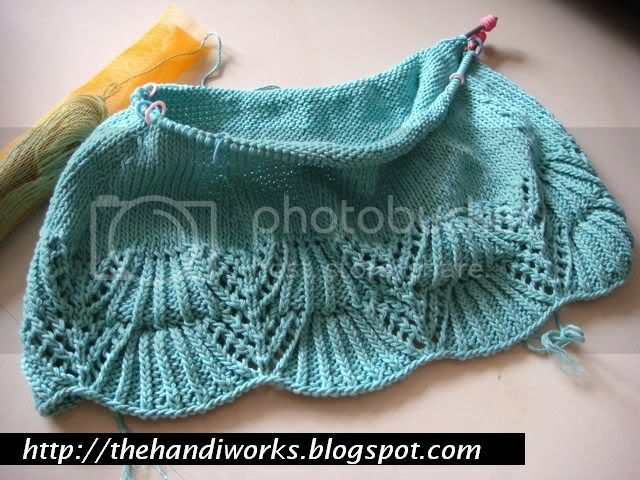 She started knitting this top back in 2007 and completed it with the same year. However I never saw the completed version. Anyway, Chai Bee kindly shared the photo of this wide neck top. The shape is very simple yet flattering. I just love how the piece shows the arms but yet provides some coverage around the shoulders. 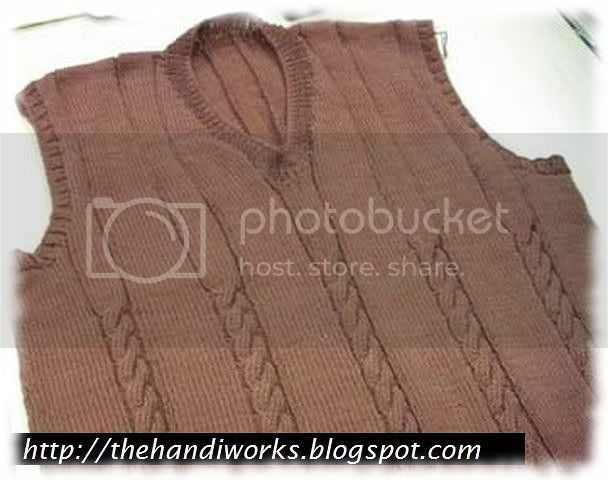 This tunic blouse is knitted from a ladder yarn and thus has a very cushy textured feel. It was a pretty straight forward piece but we bet you wouldn't have thought it would look this gorgeous when you looked at the WIP photos! And if you are wondering, there are still tons of FOs that is yet to be published! PPS. There has been several inquiries from customers who are keen to sign up with us. Please note that we are fully lined up for the month of July (we run on very limited capacities) and we will open up registrations when our August previews are setup -- do look out for the dates! We noticed that some visitors routinely come upon our websites when they are looking for knitting or crochet wedding ideas. Since we have created several items surrounding the wedding theme, we figured it's time to pull and collate everything we have in a post so that visitors can find them easily. Our most recent contribution in this area was the wedding bouquet that many of you saw. 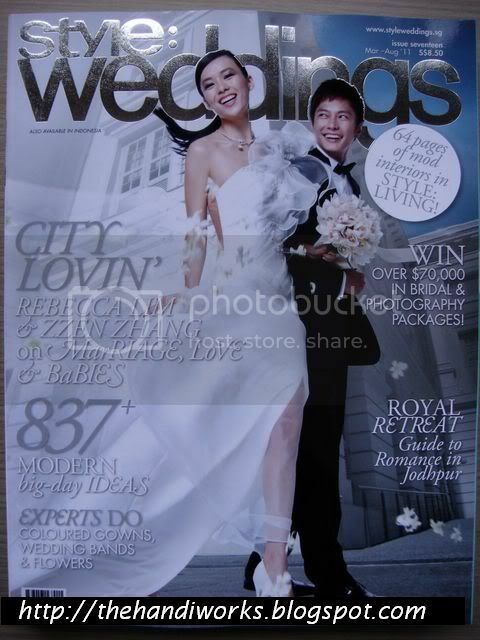 Recent is probably not the right word since it was last featured in the Mar-Jun issue of Style Weddings last year. You can read more about the project here in this post. These could also be very well translated to hairbands for the flower girls. Speaking of which, when I had my wedding banquet 2 years ago, some ambitious crafty elements had been planned but I just never got around to it. 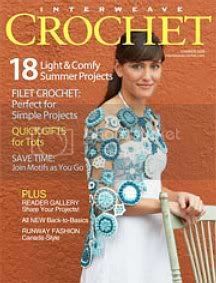 I figured I would have to get around to making that gorgeous lace crocheted dress that I had in mind; never mind if it'll be several years late. Perhaps I can aim for 2014? 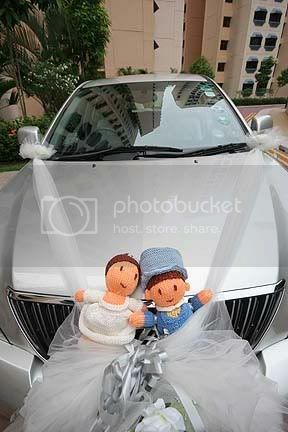 Leena, who has not only managed to wear her hand knitted spaghetti dress in her photoshoot; she also knitted a pair of wedding dolls and decorated an ang bao box for her actual wedding ceremony. If you think that's impressive, do you know the vest in that photo her hubby wore is also her creation? In fact it was her first knitting project with us! Then she also had another dress knitted for her tea ceremony. Also, I noticed during the evening dinners that the banquet halls can be quite chilly. 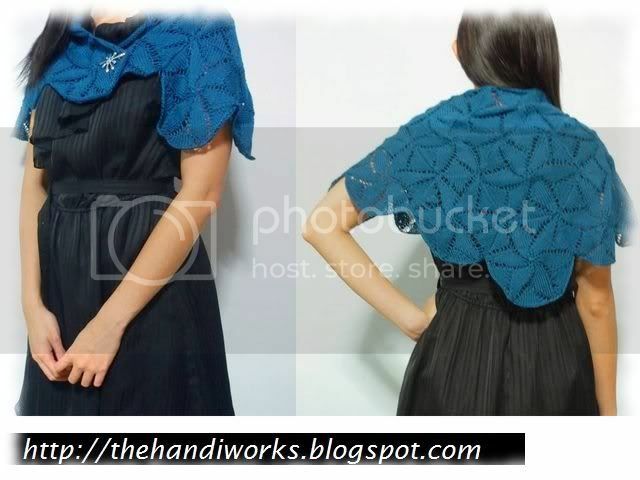 How about a lovely shrug to cover those bare shoulders? Several customers made this design as it was really pretty - here's another to read. 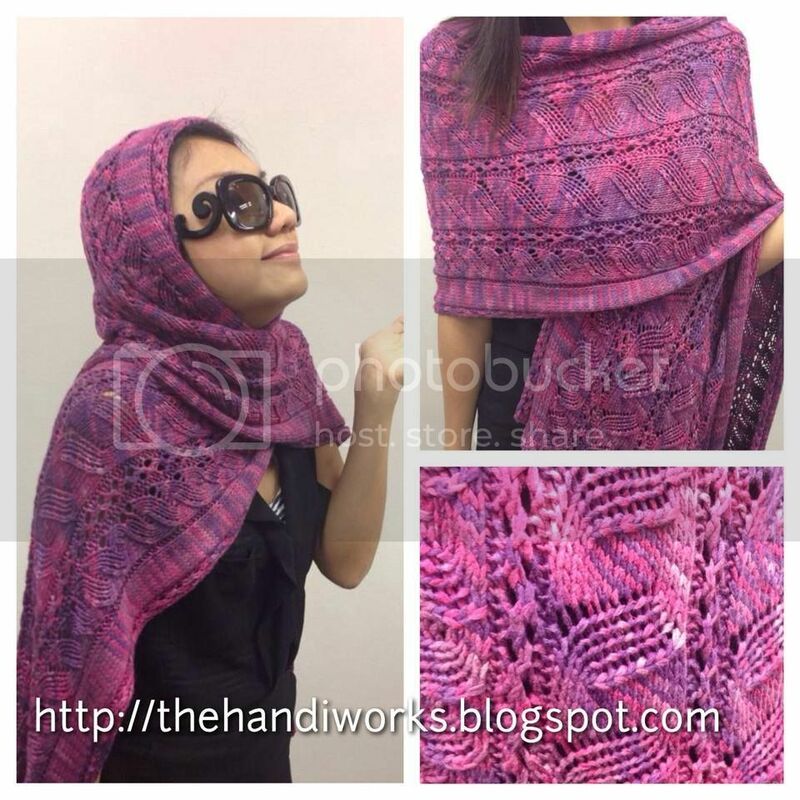 Another variation can be a shawl -- this one featured is knitted. 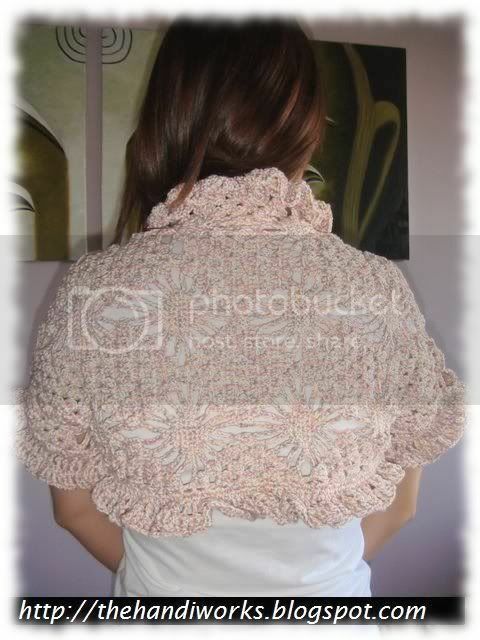 Crochet capelets also exist. Here's one done by Jenny. As for gift favors, Jenny has crocheted some cute mini rosette bouquets which I am sure would be a great hit with female attendees! And how about champagne bottles for the men?! I just simply love the idea -- you can read more here. Other things I can think about more drawstring bags, and hand knitted or crocheted flower girl dresses. the list goes on and on. Hopefully these would be useful inspirations for those crafty souls intending to add their love for knit and crochet in their weddings! In case anyone's wondering about the lack of postings lately, we've been away in April for a 2 week trip. Following our return, it was a flurry of lessons non-stop for 2 weeks -- this often happens pre- and post- holiday trips for us. Other than that, the joining of new customers have kept us very busy. We'll try to get around to posting some new faces when we have some breather. "Why not a crochet version?" And so, she brought along another pattern. To ensure she knew how to follow the instructions when she got home, we went through all the crochet symbols necessary. And ensuring that the straps go on the correct edge for each foot. Wish I had asked Jasmine to send me photos of the matched footies! 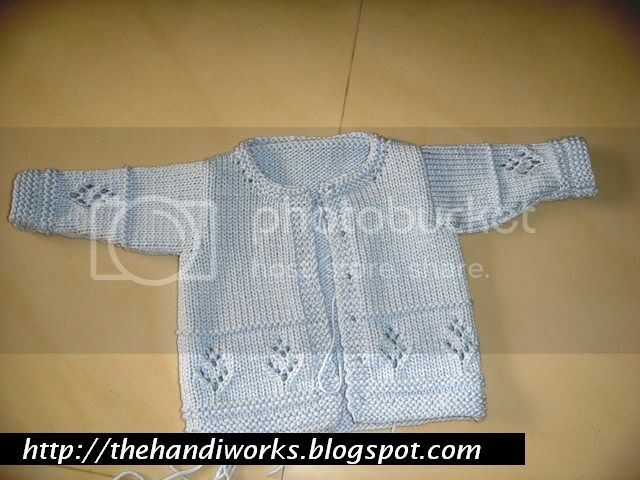 She argued that a newborn baby tee was just barely 6 inches wide -- she measured some baby clothes she had bought. 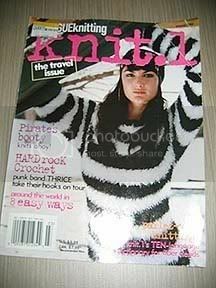 Unfortunately, that's the stock standard sizing that is widely used across most knitting magazines. Well, they say the customer's always right. Although I tried to explain to her that most moms would prefer a bigger and looser cardi for the ease of dressing the baby (given their limbs aren't as coordinated) and also for the baby to grow into subsequently to ensure longer wearability, she told me that she preferred it to be on size. So it was a trip to the frog pond. The snuggly worsted weight yarn worked up really quickly. This should easily size up for toddlers and I think the pattern works well for little baby girls too! Sorry it's been a while since we blogged. The new year got all swamped with new customers sign ups. Hope you had been able to grab a seat to attend our previews! Let us know how you like our blog by checking us out on Facebook! When Katherine decided to join us, she did it with trepidation. It's not due to fear of the unknown, as she has been knitting for 2 years. But rather, she felt uncomfortable doing a transition from her ex-knitting instructor to us. So she's requested not to be photographed in person. The Singapore knitting market is so small that almost all the instructors do know of each others' presence. While some do get territorial with their customers; here at The Handiworks, we embrace an open attitude. Teaching style is never a one size fits all. Customers are free to choose to pursue other options and decide which instructor's teaching methodology best works for them. There is no awkwardness when our customers decide to part ways and choose not to renew and then re-join or drop in for purchases subsequently. Anyway, Katherine felt she was reaching a bottleneck under her previous knitting instructor. She was frustrated that the several garment projects she knitted ended up fairly shapeless even though she has requested for fitted silhouettes at the start of the project cast-ons. Most of her visits to her earlier learning place was also limited as the knitting sessions are often large groups of varying skill levels -- there was inadequate instructor attention despite spending time waiting and was often left to her devices. Finally, our customized shaping knitting methodology to fit her personally! This is the first project she started when she signed up. Initially I was a little apprehensive as she wanted to work this project in the round as the key to proper fitting is ensuring consistent even tension. Turns out her tension is a little tighter than I would have liked but some swatching practice made her more aware of her knitting techniques and how that impacts the finished fabric. This is especially important when it comes to cotton, linen or silk as they have less elasticity compared to wool. And she already have the second project planned! OCTOBER 2016 course preview now open for registration! 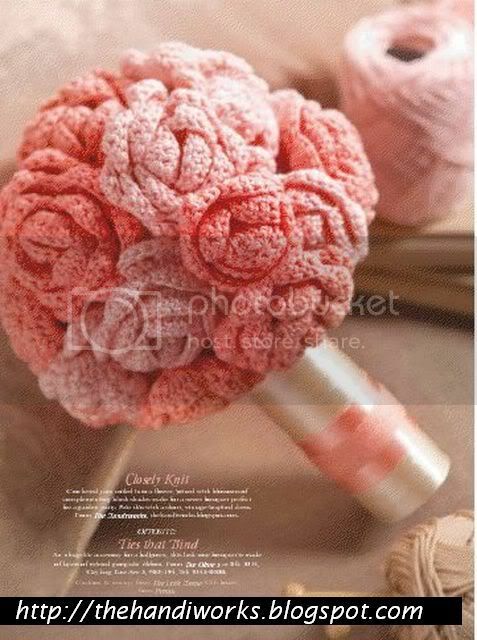 Knit.1 Feb 2006 "Knitting around the world"
Simply Her Dec 2006 "Blogging for Success"
Our crocheted hand bouquet featured in Style Weddings Mar 2011! 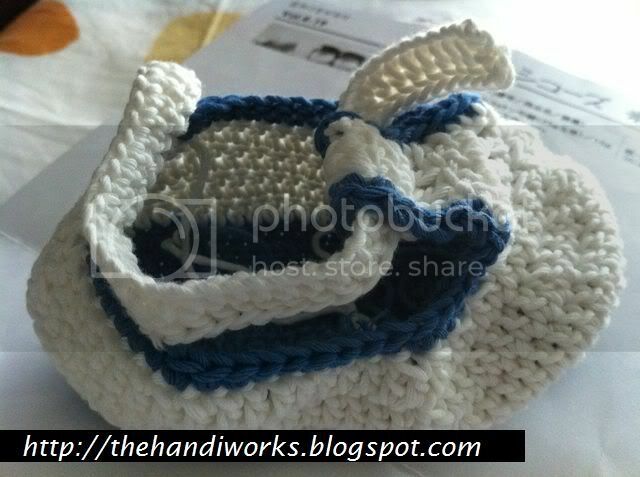 © 2006-16 The Handiworks: Knitting and crochet classes in Singapore.